Tall Black Guy – Flipping Beats from Detroit to London and Beyond! “God, family, friends, good music and life!” This is the simple ethos of one of hip hop’s most infamous and well respected beat makers and sample cutters in the game – Tall Black Guy. Terrel Wallace aka Tall Black Guy has been earning his beat maker stripes for the past decade or so building upon his foundation of Motown soul classics, funk and old school hip hop and adding layers and depth to beats that have fast become his signature style. From his humble days growing up in Detroit, Wallace was adept to the life and often gritty environment that surrounded him, which was still at that time a place of happy childhood memories and the breeding ground for some of hip hop’s finest rappers, producers and DJ’s in the industry. His love of hip hop and the creation of beats with samples fast became his burning ambition and carved the internationally renowned beat smiths Tall Black Guy has become. Gaining industry recognition and head nods from the likes of Gilles Peterson, Lefto and taking out the win for the Robert Glasper Remix competition has put Wallace in a position of pure unadulterated production power. 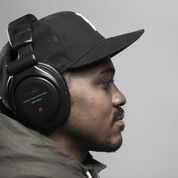 Power he has yielded with a keen sense and certainty for how he crafts his beats, using a hybrid of soul, low-slung hip hop and down-tempo house and jazz to create a pure delicacy for the earlobe. 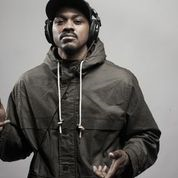 He has worked with and created music for some of the hip hop industry’s realest and holds court with the likes of Foreign Exchange, Skyzoo, Tameka Moore and The Coleman Brothers to name a few, it is in Wallace’s own personal creations as Tall Black Guy that his signature sound continues to flood through to great praises. With a strings of vinyl releases on various labels such as Bstrd Boots, First Word Records, Ubiquity Records Signed to between 2011 and 2014, and eventually his own label Tall Guy Productions does Wallace officially secure his position as a truly pioneering hip hop producer. With the release of his debut album 8 Miles to Moenet sees Tall Black Guy become a force to be reckoned with in the production world as the album sets the tone as an ode to Wallace’s decaying hometown of Detroit and the personal affects that has on an individual. 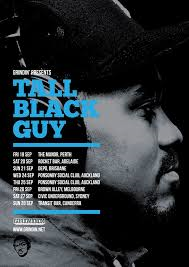 Based in the UK but reppin Detroit USA to the endth degree, Tall Black Guy makes his way to Australia this month for a series of national club gigs through Grindin. As he gets set for his trip down under he took some time to converse on his own hip hop journey, where he is going and what Tall Black Guy plans to share with his Australian fans. He is real, humble, insightful and beyond gifted in his musical ability, Terrel Wallace aka Tall Black Guy – welcome to Australia! Great to talk to you Terrel – very excited to learn of your impending visit and tour in Australia this month. How are you? I am doing fine. I am very excited to be going on my first tour ever. Right, first things first …. Tall Black Guy ….why this name and how did you arrive at it lol? While I was in college, I was one of the very few black students in my class. So to stand out amongst many creative people in my class. I decided to go with a more pro black approach for my brand. And the name just stuck from there. Researching your brilliant career to date it is safe to assume that you are more than just a producer correct. You are a Detroit producer, sample flipper & vinyl enthusiast according to my sources and dare it be said “everyone’s favourite producer’, which I couldn’t agree with more. With all that being said, how do you best describe your style and technique? I get inspired by dope samples, for example their harmonies and melodies. Usually, I chop the sample first and then I try to replay the chop on the keyboard. Then from there I might use 3-5 other samples and layer those over the top. In a session of making a beats, I might make 5 beats and keep 1 and erase all the others, even with doing that, I still let the beat rest for a day or two and then see if I can do something else different. Sometimes I might take 2-5 days to complete 1 track. So it’s a pretty long process! You have collaborated with many great hip hop names including: DJ Vadim and The Electric, Teri Tobin, Skyzoo and The Foreign Exchange to name a few. What do think it is about this sub-genre of hip hop (the alternative, organic side of hip hop as I like to call it) that appeals to so many and remains timeless in its beat production and sound? In my opinion, I think that this type of music connects with people on a soul level, because it is made by artists/musicians who are making music for the love of it, rather than for commercial success. You are born in Detroit and work in the UK, so it is definitely a case of the best of both worlds for you. What do you think Detroit has instilled in you from the real life perspective that you call upon daily in your hip hop journey? How would you best describe the two landscapes from a hip hop viewpoint – Detroit and the UK? It has been a mixture of Detroit and Chicago to be honest, both are hardworking cities to live in. I guess what I have learned from those experiences in growing up in both places, is to be stubborn and consistent with pursuing my dreams to make music and share with others. I never would compare the UK with Detroit, economically and culture wise they are vastly different. But, to be honest I never really got involved too much in the Detroit music scene whilst I was based there to fairly comment on it. So far in the UK (from what I’ve seen in London that is) I like the fact that there is a more diverse crowd of people supporting my music. You are coming to Australia for a series of cool club gigs to showcase your sound…. What can we expect from a TBG live show / set? A selection of the samples that I have used and a collection of music I have made over the years. Your 2013 debut album “8 Miles to Moenart” is like an ode to your hometown of Detroit, shining a light on her rugged and raw interior and how seeing city on the decline resonated with you. How much would you agree that the music you create is a definite embodiment of its surroundings…? And if so how has your environment and surroundings impacted on you creatively? I was in a very dark place at the time when I created that album, it was very sad for me to see a place that I grew up in, decline so much from how I remembered it as a kid. 4 albums you would take with you into the afterlife? Common – Like Water for Chocolate, D’Angelo – Voodoo, Gangstarr – Moment of Truth and the Love Jones Soundtrack. Apart from coming to Australia to vibe and perform for us, what else is TBG hoping to experience during your trip down under? I just want to record some cool sounds with my sound recorder, meet some dope people and not having to be at my day job for 2 weeks! What are your greatest inspirations and why? God, family, friends, good music and life! All of these different things have had a great impact on me to keep pushing forward and to never give up pursuing what I love.